Zimbabwean President Robert Mugabe and Zambia's President Rupiah Banda are among a handful of African leaders expected to attend his inauguration Friday morning. "I declare Bingu wa Mutharika, president of the DPP (Democratic Progressive Party), winner of 2009 presidential elections," election commission head Anastacia Msosa said. Mutharika's four-year-old Democratic Progressive Party (DPP) was also leading in the parliamentary election, with 91 MP seats out of 193 up for grabs, a significant increase on its pre-election tally. 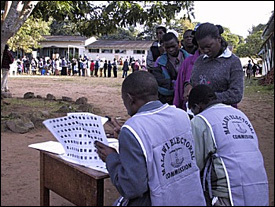 Tembo's Malawi Congress Party had 25 seats, the United Democratic Front of two-term former president Bakili Muluzi 17, and independent candidates had 26 seats. The DPP was expected to work with the independents to push through legislation in parliament. The MCP and UDF formed a coalition before the election. Tembo has yet to concede defeat. On Thursday, he said again that he would not recognize a win for Mutharika, claiming there had been irregularities during the vote count. Tembo claims the size of Mutharika's victory makes it suspect but most Malawians appeared to accept the outcome as an endorsement of the president's sound management of the economy. Mutharika, an economist by training and former World Bank official, is credited with boosting growth to an average of 7 per cent a year over the last three years and improving food security in the hunger-prone country through the introduction of a fertilizer subsidy. Muluzi, who was barred from running for president for a third time and has crossed swords with Mutharika over his anti-corruption drive on Thursday telephoned the president to congratulate him on his win.